With Vintage Vogue #2787 dress having an S-shaped front, that letter can here stand for words such as ‘stunning style’, but I can also unfortunately use the words ‘skeptical’, or even ‘stifling’. Once, however, I accessorized my dress, wore it out to a few events, and even received a few compliments, the ‘stifling’ and ‘skeptical’ part faded away. Who couldn’t help feeling like a movie star in a vintage dress that looks like this?! FABRIC: The fabric that you see on the outside of my dress is a sheer, slightly nubby, cotton knit with a beautiful drape. Its color is on the border between a blue and a green, but it is a heathered turquoise tone. There was only 2 yards of this fabric. 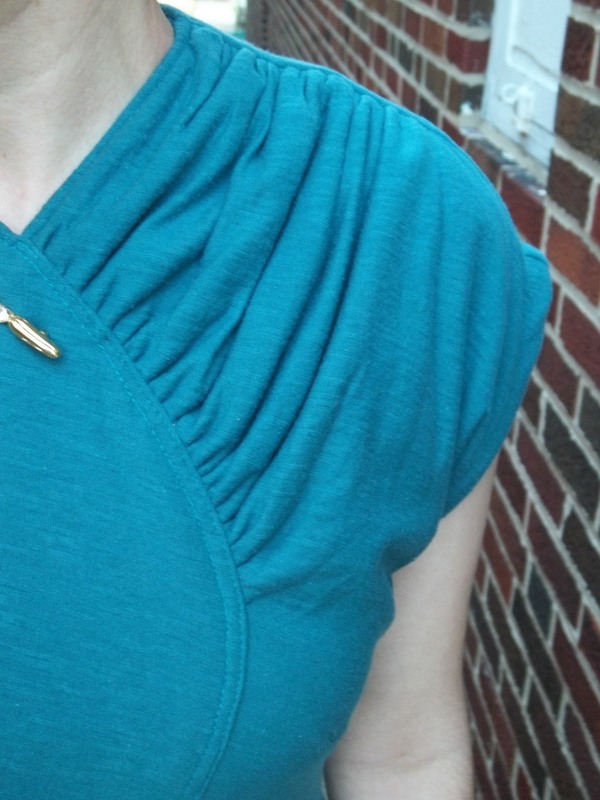 As the lining, I used a poly double knit in a darker turquoise color. Even though a poly knit makes my dress a bit less historically accurate, I had reasons for my choice that get explained below. NOTIONS: I only needed to buy another spool of thread to finish this dress. Everything else – the thread, interfacing, hem tape, and a zipper – was on hand already, bought about a year ago (which was when I matched up the pattern with my fabric). TIME TO COMPLETE: My dress was practically finished and wearable on October 25, 2013. However, I was not happy or comfortable with how the dress looked or how it felt on me, so I piddled with minor details on it off and on through winter (which was the next 5 months). I finally quit working on it and planning to re-fashion it in March of 2014. Thus, at this point, I really don’t know or remember how much time was put into my final dress as you see it in our pictures. Maybe 20 hours? Maybe more. THE INSIDES: The insides are as nice as could be with all the unusual points of the styling. Since both my dress and lining fabrics are knits, they don’t ravel, so I merely zig zag stitched the edges. 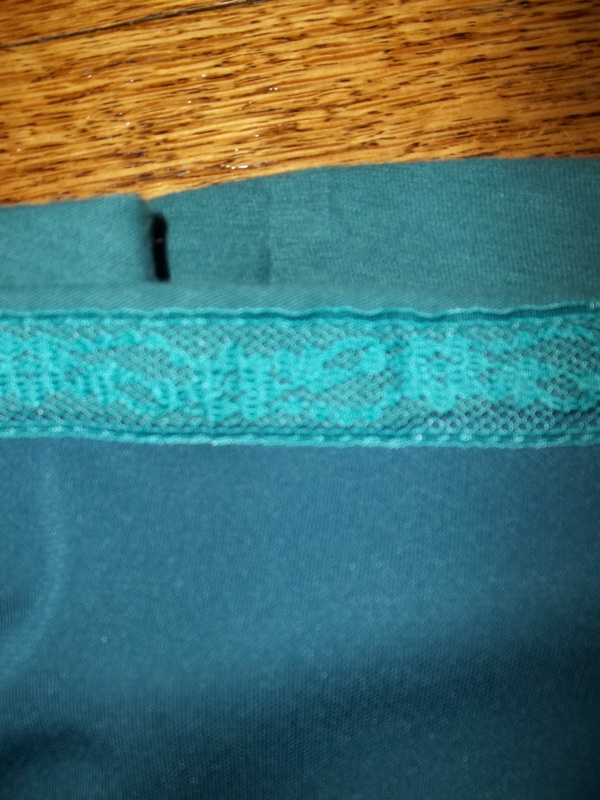 The bottom hem is quite pretty with turquoise lace hem tape covering the raw edge (see picture). The side zipper had to shortened, but I covered the raw cut end in more lace hem tape. TOTAL COST: After being in my stash forever, the nubby knit is being considered free. I had bought the poly lining knit (like I said above) about a year ago, with all the other matching notions, so I can only give an estimate of $15, more or less. 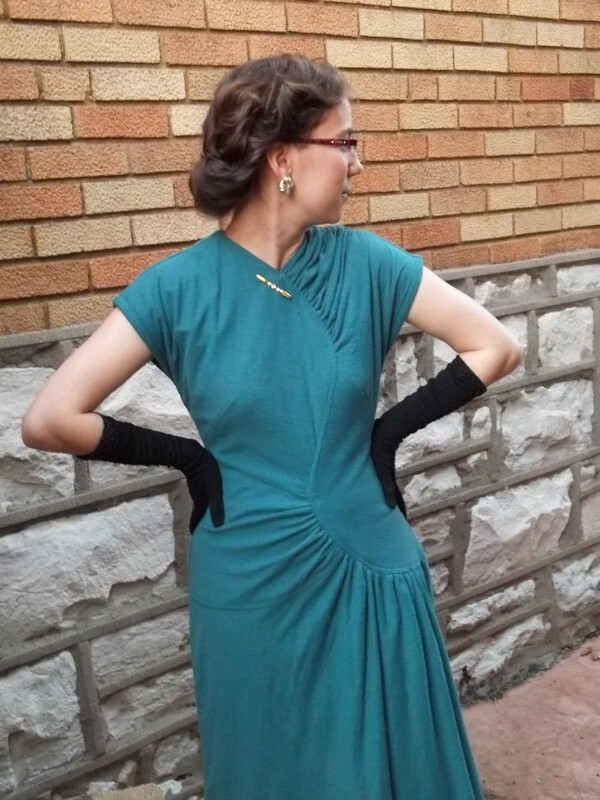 I had been wanting to make Vintage Vogue #2787 pattern for some time before I finally got around to using this turquoise knit from my stash towards my dress. A solid color truly brings out the best in this pattern, making the most of the beautiful front design. Why disguise such a unique styling with a patterned fabric…all your work goes unnoticed, otherwise. Who wants that? This 1948 dress is an excellent example of a transitional time in fashion history. The fact that the back is basic and plain, with the front having all the attention, is classic of WWII dress rationing ideas lingering into post-war times. It’s like a party in the front, with all business in the back. Gathering was also popular and widely used in many wartime fashions for women, especially between 1940 and 1946. Yet, at the same time, the slimming, modern, glamorous appearance of the silhouette this dress creates prefigures the Dior “New Look”, which was just beginning its wave of popularity since its debut in ’47. An odd mix of both WWII and Dior’s 50s style is balanced in this Vintage Vogue 2787. My fabric had been a “white elephant” in my stash for so long, being a thin, almost transparent, nubby knit in a small two yard amount. I never really knew what to do with it…until I came across VV2787 – a vintage style that calls for a small amount of yardage. Yes! I chose a poly double knit as the lining fabric, only because it was both the closest matching color and because it had a softly fluid drape which matched my dress fabric. As is my norm, many reviews and blogs were checked before beginning laying out the pattern. Adey’s blog on Sew Weekly has a an excellent review, but I especially love Viola’s review on her blog Brentwood Lane. Viola’s comment about the fit of VV2787 having a full bust, small waist, and moderate hip was so helpful, and I’m glad I followed it. For my dress, I went down two sizes in the bust and down one size in both the hips and waist, because, 1) I’m using a knit, 2) on account of Viola’s review, 3) and from reading the finished garment sizes. As much as Viola’s recommendation of decreasing the gathers on the shoulder sounded good, I stuck to the pattern after all. Since I enjoy doing gathering, putting my dress together was a fun and interesting project. 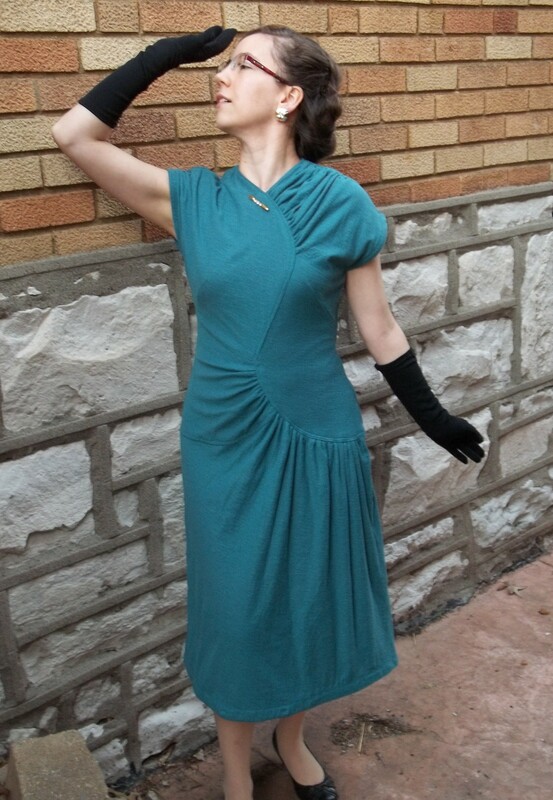 I have mentioned this fact before, when I posted about other 1940’s frocks that I have made in the past, such as this 1946 dress or this bow-neck dress. At a certain point, I did use a few choice words when I wasn’t getting the gathers just right, and I had to unpin my fabric for the 6th time. Yes, patience is a must for sewing! I was so very precise with all the markings and cutting because I wanted to achieve the exact look of the cover drawing. The front pieces were indeed very interesting shapes which made for some hard thinking to imagine how it adds up to the finished look. At first, I found all the makings overkill, and I actually left a few off, but, as it ends up…YES…all those markings are really there for a reason and VERY important to properly assembling this Vintage Vogue. It was necessary for me to go back and chalk the marking in that I had left out. I don’t see too many patterns like this one, where there’s so many spots for marking that all the geometric shapes are used – triangles, circles, squares, and spots. 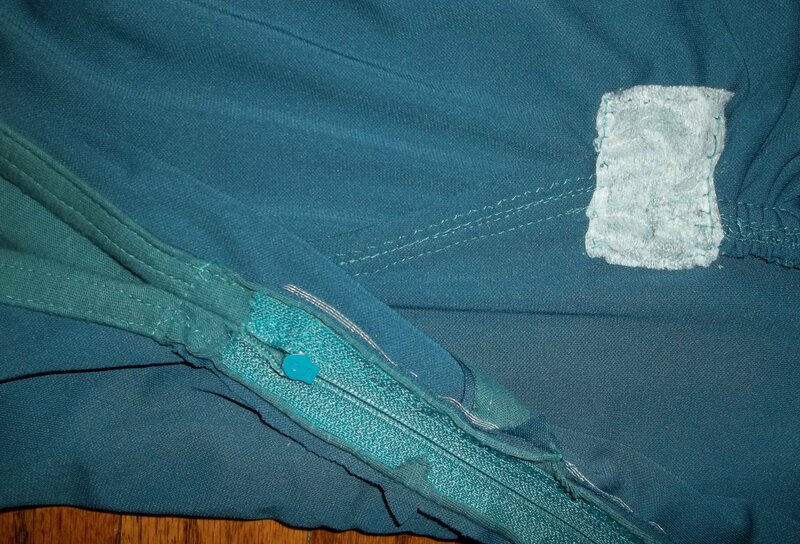 The S-front lapped seam down the middle front has a tricky crossover part. 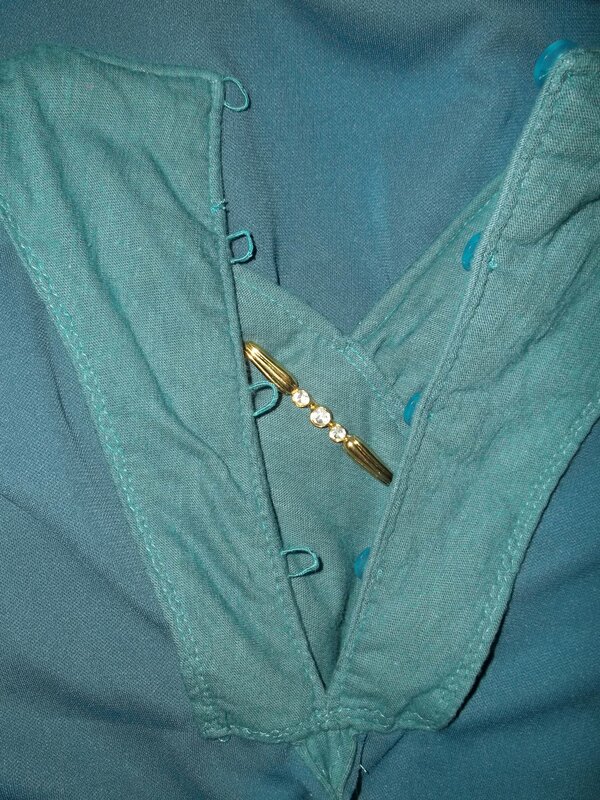 Above the bottom half of the gathers (that come from the hip), where the lapped seam peters out into a non-gathers at about the hips, the flap switches from left on top to the right on top. Top stitching supports the corners, and it really took some hand turning of my machine to set in my stitches just where they needed to go. I made sure to nicely tuck the one corner under the other so both those supporting stitches didn’t show and there wouldn’t be a hole t here, either. Inside, this crossover corner spot was also supported further by some hand stitches and a small patch of iron on interfacing. See my picture of the inside at left. The interfacing patch inside is the best thing for this tricky spot – it keeps everything nice and tight and sturdy so it’s ready to hold up for many washings and wearings! I did have a slight problem with the pattern, or at least the instructions. The inner neck facings were never really figured out exactly the way the instructions said to sew them. Instead of making the front neckline facings in one piece, like many patterns have, this dress’ facings are two separate rectangles. I couldn’t figure out if I should sew the two pieces in a vertical center seam, or if I should overlap the two facing pieces, and which side (right over left, or vise versa) I should overlap. Overlapping the one side over the other was the method I chose to join the two front facing pieces to make as one, so as to connect with the back facings before sewing to the neckline. The back facings were, indeed, quite nice with no problems (see the right picture). Hand-stitching holds down the facing edges to the lining knit only. Originally I had planned on doing self-fabric loops down the back neck opening, but I left them out when the facings were sewn down. The instructions said to make thread chain loops for the buttons, so I thought I would go ahead and try another new skill. Thread chain loops were time consuming but I like what I ended up with…so it was worth the time, even though I’m not that impressed. Please notice the four buttons I used for the back neck closure. An exact match to the color of my dress wasn’t found, so I went with a pretty contrasting color – a light blue. 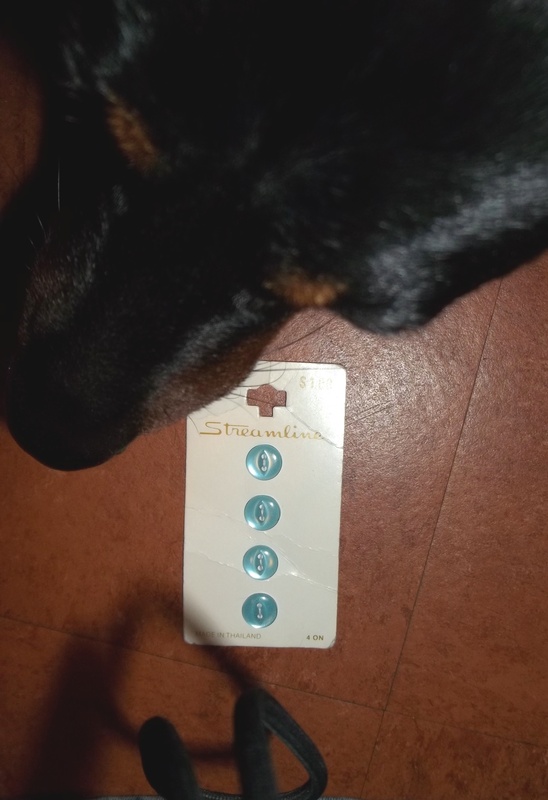 There was no one home with me at that time, so in order to decide, I had laid out a few button options on the kitchen floor and waited to see which one our little dachshund picked out with his nose. (I got a picture of this…see at left.) The buttons are vintage, coming from my familial stash, which dates back to hubby’s Grandmother. However, I really don’t think the buttons are as old as the 1940’s, although I don’t know for sure one way or another. It would be very much appreciated if any reader has any info about the “Streamline” brand buttons, or the dating of the card with its logo. Anyone who is claustrophobic, or even occasionally or slightly so, might indeed have a problem with the high, almost choking neckline. I myself have been toying with the idea of unpicking the whole top half of the whole darn S-front and refashioning it completely. “The Slapdash Sewist” blog author has a wonderful idea for re-fashioning VV2787, and it can be seen by clicking here and going about to the middle of the page. If my dress ever gets re-fashioned, I would want to change it into looking like the expensive ($725) MaxMara Saks Fifth Avenue dress which is shown as a close “modern” comparison. See picture below. There is also an Anthropologie brand “Riverbends” T-shirt top which seems very similar, as well. 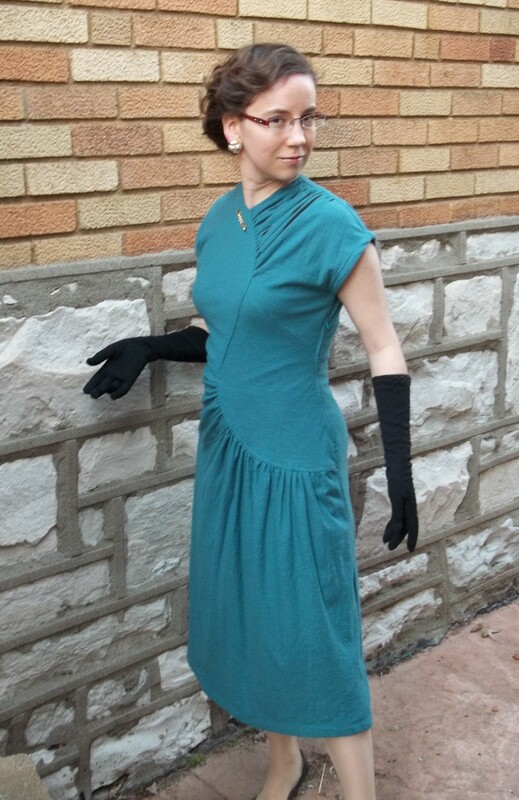 It’s neat to see remnants of my vintage 1948 dress’ S-front design around today. You can also see on her blog the nickname I have found to be thrown at this Serpentine 1948 frock – “the coffin” dress. I have seen more than one blogger stamp this scary nickname, and, to think about it, you do button and zipper yourself into the dress like a fancy straightjacket, with only your arms bare and free. (The “coffin” name also refers to the fact that the dress’ back is so plain, just as if all people would see of you is the front, just like someone laid out.) Once I stopped thinking about my dress in the light of the nickname, and actually thinking and feeling skinny and glamorous in it, the S-front Vintage Vogue is not bad at all. Design wise, it might be a bit lacking in full creativity, as with the plain back – a sort of cheapness which can be seen in many modern clothes. No doubt it has its’ own share of faults which don’t appeal to some, but, overall, I think it is definitely fun, different, and (as long as it gets loved and worn) worth making. Hey, being able to wear something you handmade is better than having a bolt of fabric sitting in the basement! In the spirit of ignoring the dress’ faults and feeling glamorous instead, I posed for some fun, but dramatic pictures while my hair was all fixed up and my long beaded gloves were on me. A 1961 “Party Dress” – It’s “Sheer” Fun! Who doesn’t love a party, especially when it involves making and wearing a fabulous frock?! Our son’s birthday celebration afforded me a very good reason to whip up a fun, fresh, and unique 1961 pattern labeled as a “party dress”. I used an old original pattern which provided me good practice at re-sizing (as it was for juniors) and an opportunity to work with new techniques by using different material. The finished product is wonderfully feminine and my unique personal interpretation of a popular retro/vintage fashion. I certainly love to be able to find reasons for wearing a dress like this! New fabrics revolutionized clothing and fashion styles between the 50’s and 60’s. Petrochemicals provided easy wash, easy care Nylon,(Polyamide), Crimplene (Polyester), and Orlon (Acrylic mix) fabrics in a variety of pastels and fun colors. It is definitely not the world’s most comfortable line of fabric. However, there is almost nothing more symbolic of the retro era than a sheer dress with a contrast underneath and an uber-gathered skirt. I am so happy to have re-created another small piece of fashion history! FABRIC: Overdress: a sheer 100% polyester organza-type fabric in a cranberry color; Underdress: a linen-look rayon/cotton blend fabric in an pastel floral print; Lining for the bodice: white matte finish polyester scraps coming from off of a rummage sale bed skirt – leftover from lining my 1940 Vintage Vogue #8811 (link here). NOTIONS: I bought about 10 yards of cranberry satin ribbon, matching thread, and a zip for the back. I already had a bit of pink bias tape, off-white thread and plenty of clear “plastic” monofilament thread, as well. 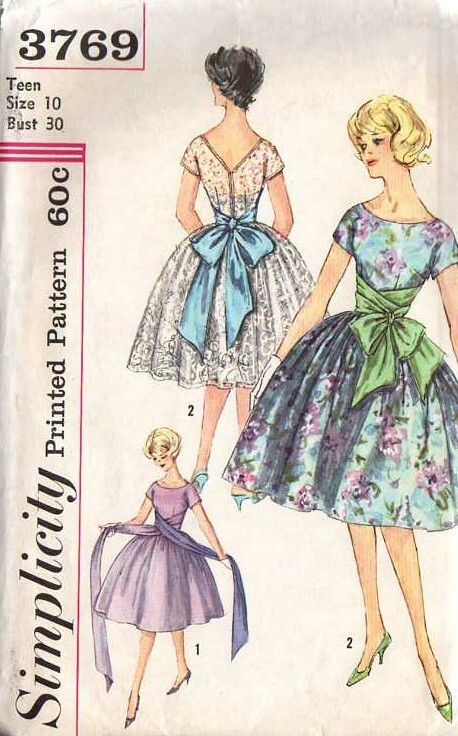 PATTERN: Simplicity #3769, year 1961, teen and junior “Party Dress” (the large picture at right). I found it at a rummage sale for pittance – only a quarter! For the sleeveless floral under bodice to the dress, I used the top half of a modern pattern, Simplicity #1876 (picture below left). I was going bold here…a strapless under bodice was entirely my idea, and not in the old pattern. TIME TO COMPLETE: My dress was finished on May 17, 2013. My nearest guess as to the time spent on my dress from beginning to end is 20 hours, maybe more. THE INSIDES: My sheer retro dress has nicely finished insides, and that was difficult to do considering all the waist gathers. The side bodice seams are the only ‘unfinished’ seams, but they are double zig zag stitched along the raw edge. 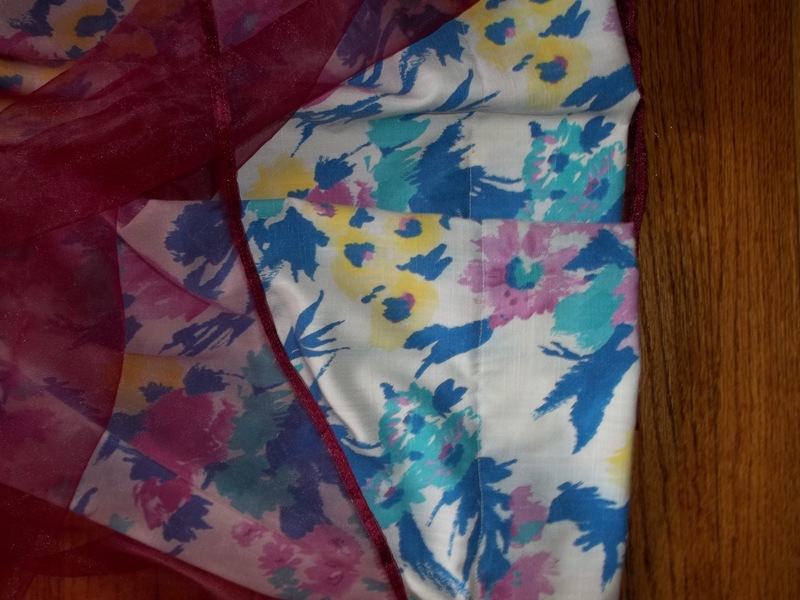 Otherwise, the skirt seams (for the under and over dress) are in French seams, all the nylon edges have a satin ribbon edging, and the linen underskirt has a wide 3 inch hem (see left picture). The inner waistband is covered in pink bias tape to ensure a comfortable feel despite all the bulk. My sewing machine impressed me…if it can sew bias tape onto the already super thick, double fabric, tight gathered waist section, well my Singer is a true trooper and can indeed sew through anything I put under it! 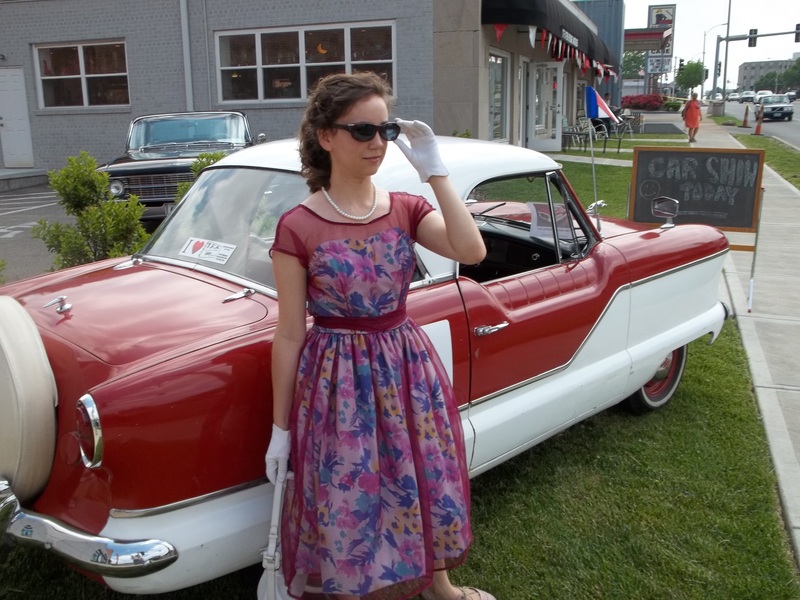 FIRST WORN: to a vintage/retro car show displaying old classic models, held at a local antique shop’s parking lot. 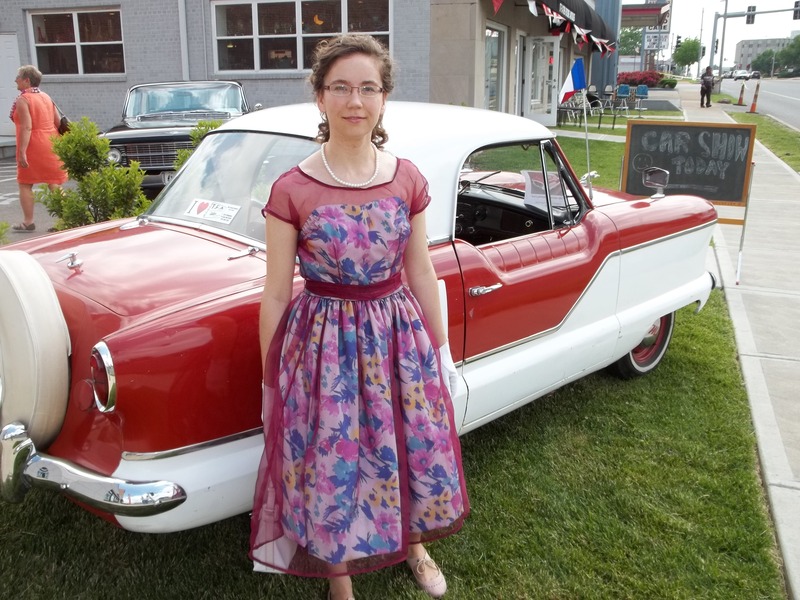 In the main picture above, by the way, the car behind me happens to be an uncommon beauty: a Nash Metropolitan car, year 1960. TOTAL COST: I don’t exactly remember anymore, but I think the total was close to $25/$30. All my fabrics and supplies were on clearance but, since I needed a lot of yardage, the prices added up. My finished dress was well worth it! I had some strong inspiration shooting off fireworks of ideas in my head, allowing me to see ahead of time exactly how I wanted my finished “party dress” to look. My first inspiration was when I saw a beautiful 1957 dress on display (see right side of picture duo) at an exhibit in our town’s History Museum. The exhibit was called “Underneath It All”, and it showed the history of the items women wore beneath, how they created a certain image, and were tied to both fashion and historical events. 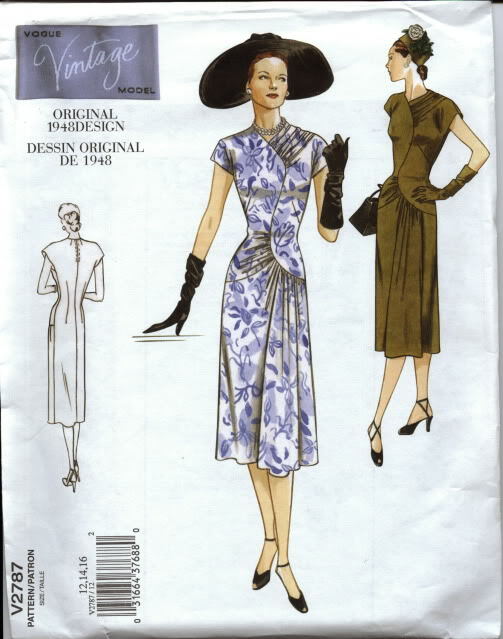 When the timeline came to the 50’s, it addressed the Famous Dior “New Look”, and the example on display was a summer batiste dress, by Josephine Scullin, with a bluish/aqua/purple floral under a solid sheer aqua. 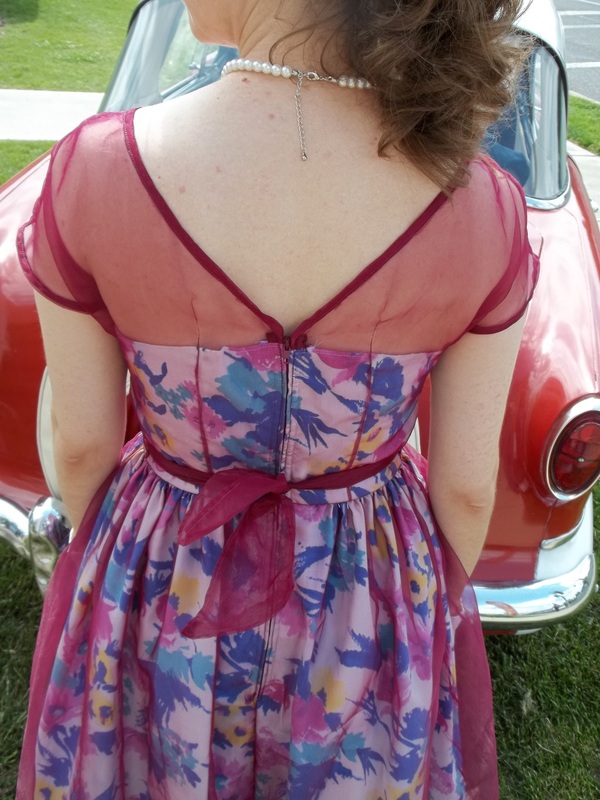 I had to make a dress like this for myself – crinoline slip and all! My second major inspiration is none other than the T.V. 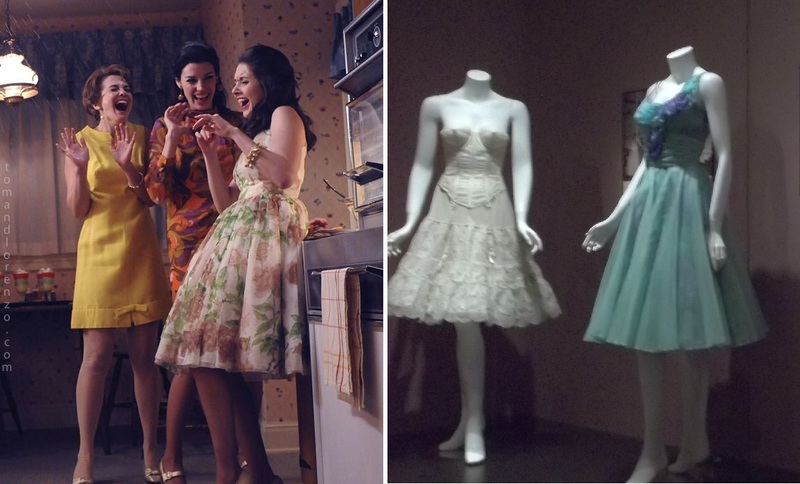 show Mad Men, much loved by many seamstresses for inspiring drool-worthy 50’s to 70’s fashions. The character of Betty especially loves to wear the classic style similar to my “party dress”, but other actresses also wore similar sheer floral frocks (see Trudy in the ivory floral dress at left picture). Just look at that beautiful dip of the back neckline! Personally, I love this feature along with the classic almost way off the shoulder fit of the kimono sleeves. I really thought ahead before and while making this dress. At the pattern stage, I had to add inches at the waist, adjust the position of the bust (as the pattern was for juniors), and take out a whopping 10 inches from the huge skirt panels to reduce the overabundance of gathers. I tried to use a spray adhesive to tack the sheer panels to the matching under pieces, but I think taking the time to do basting worked out better here anyway. 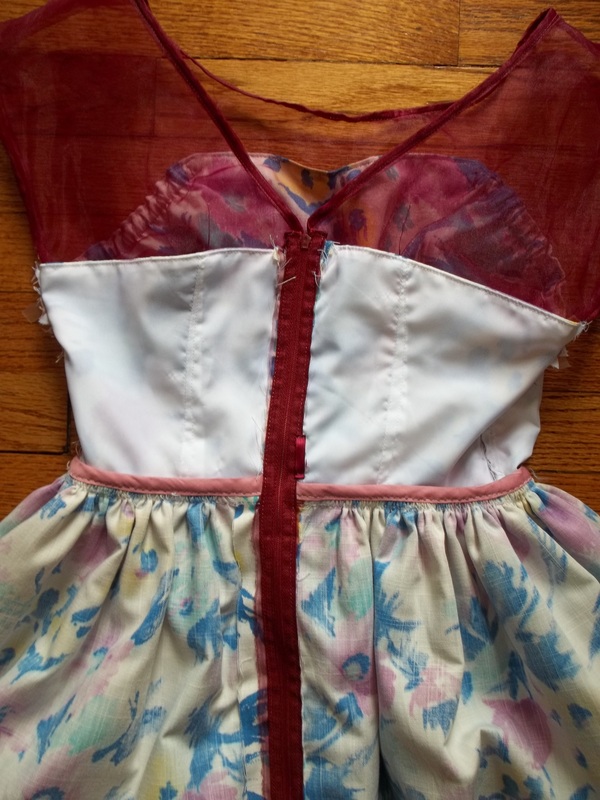 The floral under bodice’s boning was eliminated since I planned on having it supported up by being invisibly hand tacked to the organza bodice. I was very conscious of the weight that would be put on the delicate bodice and shoulder seams, seeing that they are only the sheer organza. A delicate satin ribbon facing goes under the sleeve, neckline, and shoulder edges for a smooth, non-itchy feel which would fashionably support the barely there seams. The entire hem of the organza over skirt was also hemmed with the ribbon…I love the resulting look but, believe me, the work was long, frustrating torture. The only fitting that was needed on my “party dress” after it was done was to fix some slight gaping along the sides of the bust and under my arms. I came up with my own out-of the-box idea. Sewing in bias tape “channels” along the top inside edge of floral sleeveless under bodice, I started from the side of the center bust to under the armpits and fed through elastic. The elastic channels gently gather in the excess fullness without confining the bodice at all. Gathers surprisingly also gave the dress’ top half some added complimentary shaping. 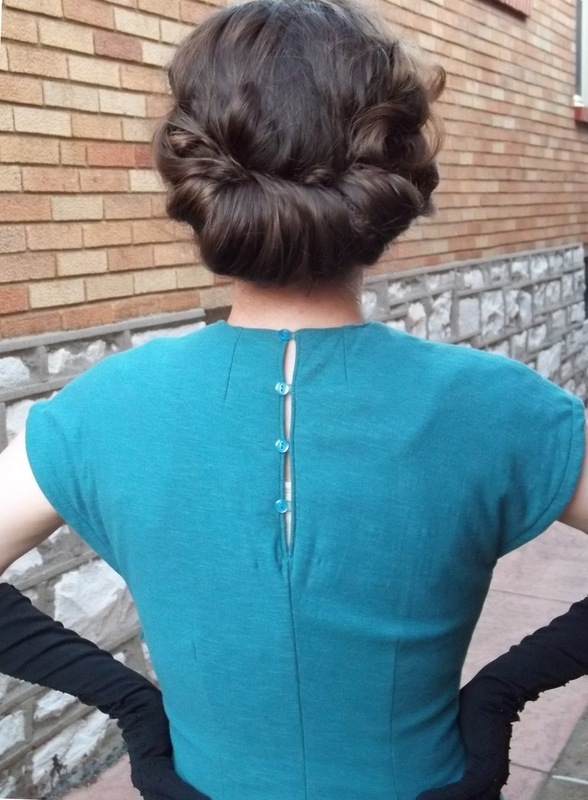 A simple sash tie belt was made to wear at the waist of my dress. The pattern called for these two giant sashes to be made and sewn into the side seams, so one could wrap them around the dress and tie into great big bow. I wasn’t sure if I was going to want this feature on this dress, much less be committed to it by having them in the side seams, so I left them out. However, I do still have enough sheer fabric to make the cummerbund sashes. One day I would like to sew them up, tack them to the sides, and see what that would look like. The giant sashes might give the “party dress” a completely different appearance I might love…an update will be posted here if that happens. My crinoline petticoat under slip helps create the proper shape to my “party dress”. I bought it here at Unique Vintage and I really how soft it is with the layers of ruffles. It features a draw cord waist that tends to loosen a bit as I wear it, no matter how I double tie the bow. So I added little loop at the inside waistband of my dress so I can connect the petticoat and the dress together. I did cover all the sheer seams in fray check just to make sure they don’t end up with a big run or rip too easily. So far so good! Someone gave me a wonderful compliment one day when wearing my “party dress”. She told me my dress reminded her of something Grace Kelly wore in the Hitchcock movie “Rear Window”. I went home and did an internet search on the subject and did find a dress quite similar in my respects (deep V-back, sheer poufy overskirt) to my own “party dress”. See the picture below. 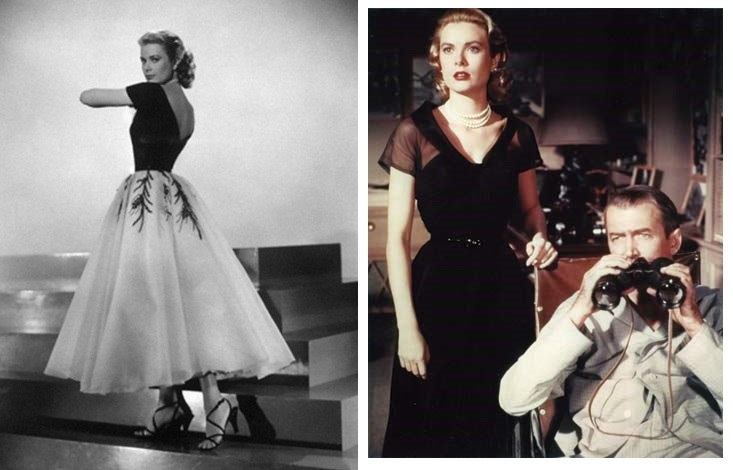 Grace Kelly also wears another dress in “Rear Window” with a similar sheer bodice which is strapless underneath. I hope you have enjoyed my post and get inspired to make your own wonderfully fun party attire. Now all that is needed is a party! I will post more photos soon on my Flickr page, Seam Racer.